Handset maker Oppo's sub-brand Reality will launch its second budget smartphone Realme 2 in India today. For the past few years, many teasers of Reality 2 have come out. 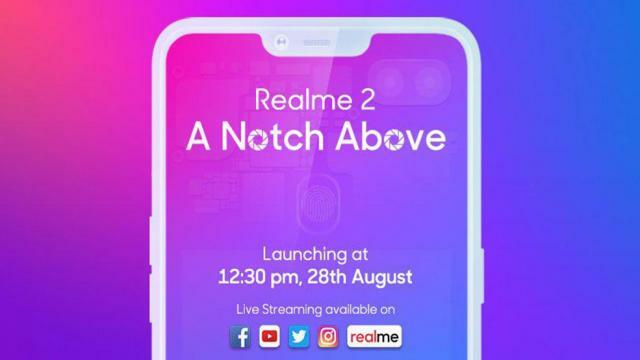 According to the teaser, in realme 2 you will find display notch, two rear cameras, and multicolor option. Reality 2 will be sold exclusively on e-commerce website Flipkart. Upgrade version of Realme 1 is Reality 2. Let's say that Reality 1 is sold on Amazon. Realme 2 launch event will start at 12:30 pm. Real-time 2 live events will be on the live streaming company's official Facebook page. We've linked to live streaming for you. After the event starts, you will be able to see the launch event at home by clicking on the play button below. It is expected that the price of Reality 2 can be less than Rs. 10,000 in India. The company has claimed that it will be the first smartphone in this price in which customers will get a display design. The exact information of price and availability will be revealed only during the launch event. Customers will also be able to see the live streaming on Flipkart page. The Realme 2 battery will be 4230 mAh, which is 20 percent larger than last year's Realme 1's 3,410 mAh battery. It will be made available in Diamond Red, Black, and Blue colors. On the previous side, the company's identity will become Diamond Cut design. A fingerprint sensor will also be provided on the back panel. The first Realme was a sub-brand of Oppo. But now it has been made a separate e-commerce brand. Realme has confirmed that Realme 2 Qualcomm will come with Snapdragon processor. However, the company disclosed the name of the processor. Remember that Realme 1 MediaTech comes with Helio P60 processor.